Seven days from a detox recovery diary documenting the bleak autumn world of complex nuance we’re born to inhabit; and how that needs to be reconciled with imagination and paradigm and impossible fantasy. Trying to offer a different paradigm for how the brain creates consciousness and how this engenders the self “I”, we consider the implications of identity being constructed on the fly - like a frame rate - and how this perspective might hold the key to our place in the universe. This early contribution is an ‘in the middle’ write-up of personal experience helping a near relative going through cold turkey detoxification and - continuing the close support - the months of “recovery” from that deepest most extreme of addictions: fentanyl and heroin - opiod and opiate. These “Voices of the Dead” lists are simple scattergun selections from the vaults of the dead. We’ve tried to stick to significant diverse individuals who’re worth your time and deserve to be part of collective active recall. 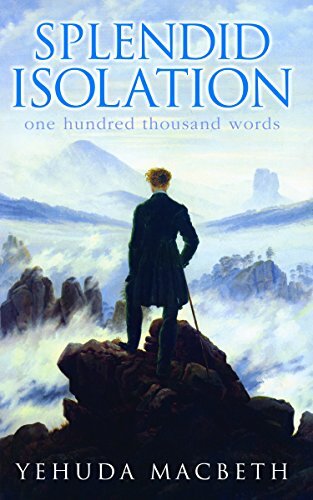 Splendid Isolation is the first novel by Yehuda Macbeth written at the turn of the millennia. It documents two weeks in the life of an unnamed central character, all the insight in the world into the stream of consciousness playing out in his head but no time to even mention his name. Love and loss, youth passing and times past: the themes are universal, the intimate portrayal told at profound and engaging pace. Four families cast adrift on a sea of troubles soon become the flotsam of life choices daring to manifest real action against the path of least resistance. Jane and Marion endure. Paul quips. Rose finds God and the freezing snow. Andy finds Emily. Emily finds the Knife and the Needle. Nikolai finds Ecstasy in the Antifa. Alex finds himself far from the city, helped by a wise old man, taught by a man who was once a teacher but carries a dark secret. Jack falls down, forever. Gabriel Kithingee finds his singing voice and Juliana Kithingee finds boys too funny, adults too serious and a future across the ocean in the land of the blind. Burning the candle at both ends doesn’t just shorten the candle’s life, it mutates the candle slowly into something grotesque; the more so because it’s still the same wax that once was so young and beautiful. 100,000 genial protestors (out of 3.2 million Remain and EU voters in London) were estimated on the pro-Europe People's Vote match. Hmm. Brexit Impact Tracker : Pretty nifty list of the UK being the world’s test case for less government?